As the owner of an Alaskan Malamute, I can tell you I have looked through quite a few training books. The breed is known for their sweetness and intelligence, but also their stubbornness. If a malamute doesn’t want to do something, you better prepare yourself for the battle of wills between you and them. While I have read a handful of great books, I am always on the lookout for great dog training books. When I was asked to review Dog Training Basics: All in One Startup Guide, I was excited to give it a try. After it arrived on my Kindle, I immediately got started! I have to admit, when I first started Dog Training Basics: All in One Startup Guide, I was very excited. As a general rule of thumb, I always seem to learn something new when I pick up a dog training book. The book itself does a pretty good job going over the different training styles. While I think this section could likely be shorter (they seem to lose focus a few times), it seems very useful for the novice dog trainer. The tips for training different commands are also helpful, but rather generalized. 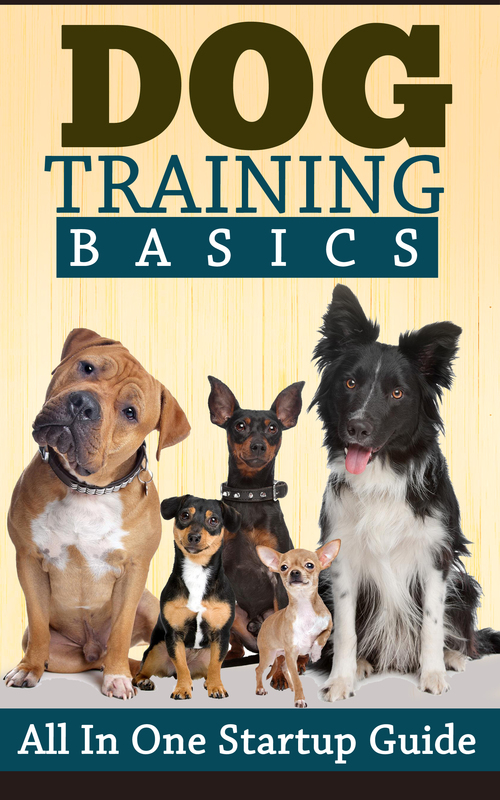 As the book says, it is a starter guide for people who are looking into training their new pup. I’ll admit, this book has some issues. Probably the largest problem I had while reading is that it is riddled with spelling and grammar issues. It may be the teacher in me, but about halfway into my reading it was driving me nuts that I couldn’t correct the issues with a red pen. I know many people don’t care as much as me, but poor grammar is one of those things that I feel lessens the authority of a book. If these issues were taken away and some of the sentences were re-written, it would have been a fantastic beginner’s book. The only other issue is that I think a bit too much time was spent talking about the psychological theory behind all the behavior practices and methods. As someone who specialized in psychology, I found it interesting, but it felt like they went into a bit too much detail for the common reader. Overall, judging the book by the information (and not the presentation) of it, I think it’s decent. Not the best book I’ve ever read on dog training, but not a bad starter either. What really makes it appealing is the low price. Most training books I have read or purchased start at about $15, making them pricy for someone who just wants to teach their dog the most basic of commands. So, for $2.99, it really isn’t a bad book for the beginner. Just go into it understanding that it is not the perfect book for training all dogs, and you should be fine. Based on my own experience, I would give the Dog Training Basics book a C+ rating. Want to give this book a try? You can purchase Dog Training Basics: All in One Startup Guide on Amazon.com for $2.99. I may have to check this book out. We recently adopted a rescue dog- he's a sweetie but needs some light training. I sometimes rescue puppies form the street in the neighborhood around our second home in Europe and have always been put off by the price of dog training books. This sounds like a great deal for me! I once took our puppy to obedience school and he did really well. Unfortunately we no longer have him (cancer) but if we ever get another one I will check the book out. We can sure use this with our 2 dogs-thanks for the review! I think the grammar issues would bother me as well! But, for $2.99, I would be willing to try to overlook them because I do have both a need and desire to be a better owner to my fur babies. I have two chihuahuas who have self-designated themselves as the neighborhood watch/listen team and they bark at every sound or movement. I would love to learn how to control their barking. I know that they believe they are doing their duty and protecting me, so I hate to yell at them. Yelling does not solve the problem anyway! Since this book is budget friendly, I may pursue a purchase. I have a 7 month old basset hound and she is really hard to train. I work with her everyday, some things she picks up quickly, other she forgets quickly. I might have to check this book out, thanks. I'm going to have to get this book. This would help me in so many categories with my dog. Thanks for this review. I got a puppy a couple months ago and I've actually been thinking about getting a book for her. I don't think I could stand all the grammar issues. That really bugs me when I'm reading just a little post and there's a lot in that. I don't understand how that hapens. I mean, don't they proofread? Will def. check this book out. Thanks so much for the info ! We have a new puppy!! low price is certainly good. You said it wasn't the best – what books would you recomend then? strongly i mean. I'm not a teacher or a professional but there is nothing that is more annoying then improper english. I'm not perfect but if I was publishing a book I would make sure everthing in it was perfect. I'm always interested in other peoples training methods so I'm definitely going to check it out. Thanks for the review. As a long time animal advocate & rescuer I’ve seen it time & time again. Dogs literally thrown away due to behavior problems. If obedience is important to you as a pet owner please do your homework. Some breeds are easy to train, others are almost untrainable. There’s a comment earlier about a Basset being difficult. I’ve had one for 6+ years & he will mind , sorta. These are scent hounds & guided ny their nose. They get a scent in their head & they get tunnel vision & don’t seem to hear or see anything. I love him to death but I do have to protect him from his nose. Anyway, thanks for promoting this book because, to me, anything that helps the animal & person live easier together is a good thing. That is very very true! We have an Alaskan Malamute & the breed is known for listening when they ‘decide’ to listen. Training takes quite a bit of time, making them not the perfect dog for everyone! Btw, please excuse my grammar & spelling errors in last post, wasn’t an english major(obviously). I’m glad there’s a dog training book at such a low-cost. I wouldn’t be able to get past the error in grammar easily either. A good starter-book is what this one sounds like to me. Since we all have to learn how to train our pets, it is a good place to start. The price is certainly good. Thank you for your review.